To get the best, you have to start from Square One. An indistinct warehouse in the backstreets of Cremorne masks the inner workings of one of the biggest moments in Melbourne’s coffee scene. While in production for the last 8 months, it’s only now that the team are ready to launch their product to the world. We’re excited to be exclusively helping launch Square One’s brand and beautiful retail packaging to the world. Elika Rowell is the roastress extraordinaire for Square One, having built up her passion and reputation on the floor through Three Bags Full, Seven Seeds, and Top Paddock. Her motivation to transition to roasting is a natural one; “to continue my own personal growth path, roasting coffee is the next step to understanding the true nature of the beans”. And topical as ever, as we’re celebrating International Women’s Week, Elika is the latest face in an ever growing movement of women in Melbourne’s coffee scene. Once dominated by men, there are now a powerful lot of females in the coffee industry who are making changes for the better, and running empires that influence our daily drink. Roasters, business owners, and baristas alike, women are taking over the coffee scene and turning it into something outstanding. Melissa Floreani from Clark St, Bridget Amor from Seven Seeds, and Fleur Studd from Market Lane just to name a few. These are businesses that have set the global scene for coffee and have made this city famous for it, and now Elika is joining their company. Square One is the brainchild of Elika and a few of the Top Paddock owners. 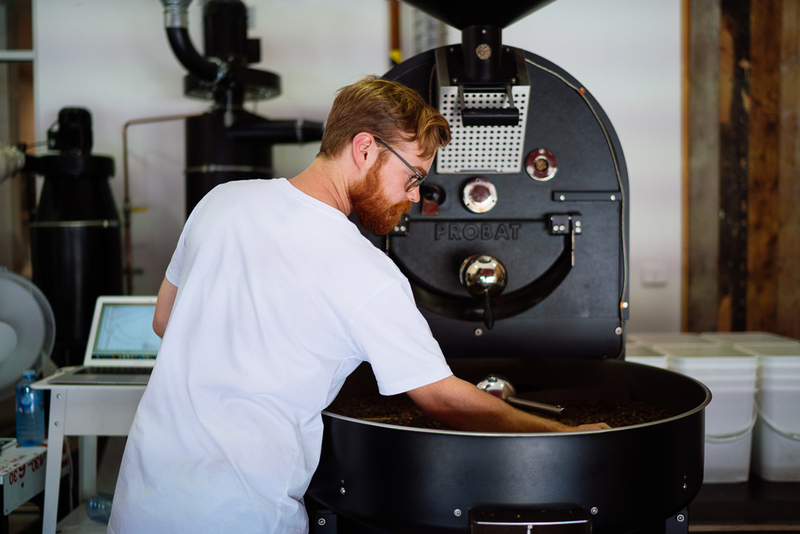 The guys at TP have always been of the belief the product quality is always better if you can make it yourself, and as such have grown to a point where having their own coffee roaster makes a lot of commercial and quality control sense. They have full control of the coffee from selection right down to the recipe of your espresso. What does this mean for all of us? It means their coffee is absolutely second to none. And this is what you’re tasting this month. For the Filter subscribers, Elika has selected the Gitega from Rwanda. With hints of passion fruits and melons, this is one of the sweetest filter coffee’s you can get. For the espresso members, a classic Brazil with a twist. The Sitio Cascata is bubbling with honey, strawberries, and plums. It’s so interesting and unique because it’s quite a clean cup; very rare to get such a clean Brazilian. Both lots were sourced by MCM. We asked Elika if she had any advice to female coffee lovers and admirers around the world who are thinking about getting into coffee, and she gave us an answer we can all agree with: “Don’t be scared. We own this now”. Rightly so Elika. Women taking over the coffee world, one delicious espresso at a time. Go out and enjoy this stunning coffee, with some of the most unique packaging we’ve ever seen.